The Eisenhower Memorial competition and project have stirred a remarkable polemic, the center of which is not President Eisenhower or Washington, D.C. but Frank Gehry and the values he promulgates. I am writing not as an enemy of Mr. Gehry but as a lover of what the nation’s capital for two centuries promised to be, could have been and may still become. We both teach at Yale School of Architecture, Dean Robert A.M. Stern’s academic spaceship allowing contrary positions to be taught and debated in polite conditions. Against expectations I was charmed by Gehry’s Edgemar development, which housed the Santa Monica Museum of Art, and positively awed by the Bilbao Guggenheim. That Gehry is a great artist I have no doubt, but talent and determination are no warrant against confusion, nor are they a guaranty to produce great art. Looking at his work and reading his justifications I conclude that Mr. Gehry is a great but greatly confused artist, who was appointed by a commission who shares his intellectual confusion and distaste of a classical Washington, D.C. They form a powerful fraternity, believing in the exclusive legitimacy of Modernism, a theory that has been brain-dead for half a century but keeps dominating positions in academia and its dependent culture industry. This theory, at first fired by fossil fuel energies combined to an atavistic belief in infinite progress, is now held alive by fear of regression. The fear of backwardness is what blinds the believers to the technological treasure house of traditional architecture and urbanism. The ensuing technological and artistic amnesia is responsible for the cataclysmic degradation of the built environment, of which the Southwest quadrant of Washington, D.C., where the Eisenhower Memorial is to be located, is a notorious demonstration. Mr. Gehry is well-known for buildings whose forms suggest not the “frozen music” of Classicism, but frozen melt-down and explosion, paralyzed tremor and arrested collapse. Indeed the remnants of the World Trade Center were eerily reminiscent of Gehry’s style. He justifies his designs as being uniquely expressive of the “creative chaos and energy” that, according to him, democracy stands for and engenders. If his proposition were true, that “creative chaos and energy” would indeed not only affect all building design but equally that of tools, vehicles, machinery, engineering works, agriculture, cooking, language. Why would architecture and art have to be the lone bearers of epochal stigmata? As a militant modernist and post-modernist he strongly believes that Classicism, Traditional Architecture and Urbanism are and should be passé. He frivolously overlooks the fact that American democracy and institutions are to this day uniquely associated with and symbolized by Classical and Traditional Architecture, and that 99% of private residential architecture is of traditional orientation, if not conception. Surprisingly the Eisenhower Memorial design contains almost none of the known Gehry-box of tricks. His giant etched chain-link curtain, first applied in 1979 to hide an ungracious parking garage at Santa Monica Place, is resurrected for Eisenhower to screen the equally graceless facade of the Department of Education. The chain-link aesthetic, far from being original, is a widespread formula used since the early 1950s in Germany by Egon Eiermann to dress up superstores. 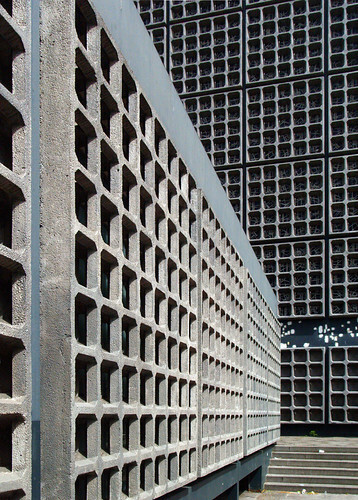 The American Edward Durell Stone did the same to new U.S. Embassies around the world. The screening of banal buildings with a variety of metallic and synthetic “textiles” is currently a worldwide fashion. Mr. Gehry claims to be a contextualist, however he ignores and condemns the operative technology of traditional urban and architectural settings, his signature language is self-limited to an architectural “newspeak” hemmed-in between German Rationalism (Mies, Gropius) and German Expressionism (Finsterlin, Schwitters, Murnau). The Gehry style is a century old; it seems “innovative” only to the ignorant. That Eisenhower, a great general and president, should be remembered on that location, in that scale and style of architecture is a provocation. The foreseeable and justified answer to willful provocation is protest. There has not only been growing criticism but the National Civic Art Society (NCAS) and the Institute of Classical Architecture & Art (ICAA) held a Counterproposal Competition that showed serious alternatives contributing to a completion rather than a disfiguration of Pierre L’Enfant’s plan for the capital. Classicism is an art form and craft that, contrary to Mr. Gehry’s opinions, is capably practiced by many contemporary architects and craftsmen, taught by universities and championed by democratic professional and civic institutions. Mr. Gehry’s wholesale condemnation contradicts his professed democratic spirit of toleration and his advocacy of heterogeneity. The Eisenhower Memorial Competition cost $19 million while the Counterproposal Competition organized by the NCAS and ICAA spent a mere $2,000. The WWII memorial, two of which could fit on the Eisenhower Square site, cost $182 million. It was realized in natural stone and traditional techniques. It is foreseeable that the XXL size and experimental nature of the Gehry scheme will cost more than the announced $112.5 million. Monuments are expensive and that is why in D.C. they traditionally are kept at a fraction of the proposed expanse. Mr. Gehry cannot be blamed for the choice of site but he alone is responsible for sprawling his memorial over an entire city block. For $112.5 million a fine classical building can be built with grand proportions and the finest materials. Instead, an oversized forecourt without a building is proposed here, a Bernini Colonnade without a St. Peter’s, so to speak. What can possibly be the meaning of a monument without a center or focus? A ruined temple, a roofless structure with 10 pilotis standing? Why 10 raw tubes, recently reduced from the original 13? Was that slimming down due to a budget cutting measure or to the ill-fated reputation of number 13? Who is to explain? The scale and character of the blotted tagged fence relates more to highway billboards and graffiti than to the historic tapestry it declaredly refers to. The giant illustrated screens intend to create a sacred memorial area, but the devotional imagery is perceived like a mere backdrop through a thicket of trees, best read from the outside. The centerless monument effectively amounts to an open-air cinema overtaken by a wild-growth of sycamore. An anti-monument if there can be such a thing. My guess is that there is no intended meaning in the extravagant size. Why should the Eisenhower memorial be over twice the size of WWII Memorial? Why should it be so vast as to comfortably house two Lincoln Memorials, two Washington Monuments, and two Jefferson Memorials all six at once? The fact that these three memorials can be fitted on site, leaving an ample piazza between them, demonstrates that, to put it mildly, the organizers are unconscious of the sheer size of the undertaking they are embarked on. [See illustration below]. President Eisenhower is known to have been highly critical of modernist art. The American Battle Monuments Commission, on which he served as an officer, became famous in the U.S., and after WWII around the world, for a supremely serene, restrained, elegant and modern form of architectural and landscaping Classicism, largely indebted to the spirit that guided the 1901-2 McMillan Commission Plan that created the National Mall as we know it. The post-war redevelopment of the Southwest D.C. neighborhood, beyond the human tragedy of wholesale clearing an entire urban community, replaced L’Enfant’s urban armature and network of streets and squares with a soulless nowhere. The gruesome operation was a crucible for imposing on Washington, D.C. the modernist vision so detested by Eisenhower, abhorred by the users and occasional visitors and avoided and ignored by those who have no obligatory business there. 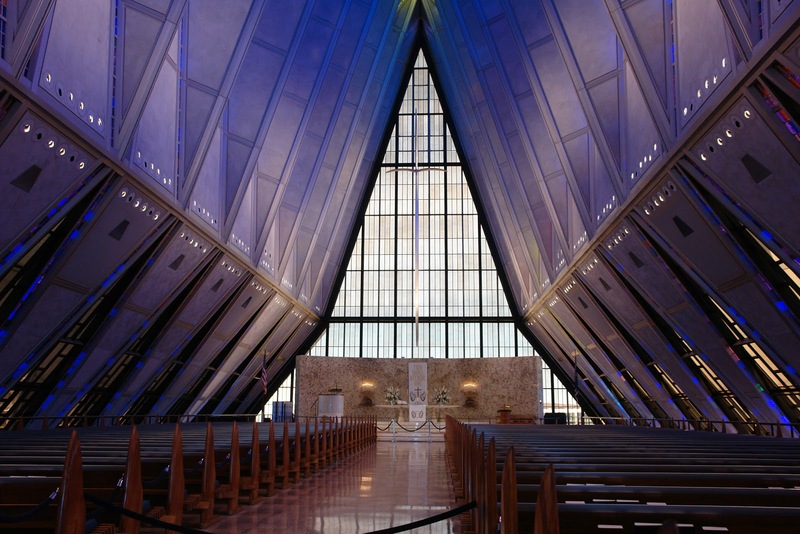 Vocally critical, even disgusted by modernist art and architecture, if Eisenhower was apparently upset about the Air Force Academy Chapel by Skidmore, Owings and Merrill, how distraught must he have been with the brave new world taking command over the Southwest quadrant. Yet that is precisely the architectural context the Memorial Commission elects as location and Mr. Gehry respects and emulates in scale, style, proportion and character: a straight, undiluted old fashioned modernism. In my opinion his expressionist design formulae would yet effect a welcome respite from the debilitating boredom of the area. As demonstrated by the Counterproposal Competition, the New Eisenhower Square can also become the occasion for a critically needed Washington, D.C. urban Renaissance, resurrecting the human scale, the measure, color, variety and soul of the original L’Enfant vision, as brilliantly demonstrated by Francisco Ruiz’s proposal (3rd prize in the Counterproposal Competition) symbolically much better attuned with Eisenhower and his legacy. Leon Krier is an architect, architecture theorist, and urban planner. He is known for his many manifestoes that include topics such as zoning and megacities. First of all, I consider the site of the proposed memorial to be wholely inappropriate. the revolution and Washington was the main event in the 18th century. The Civil War was the main event in the 19th century. WWII wins the prize for the 20th century and IKE should be on the Mall. His accomplishments should be displayed clearly and in a fashion that does not require “artistic insight” The 20th century was VERY real and so should be his rememberance. NOT some airy fairy depiction of a home town boy made good!! !